CarGurus has 1,516 nationwide TSX listings starting at $2,552. The 2014 Acura TSX lives on the edge: too big to be a compact, too small to be a midsize, too affordable to be high-end luxury, too well-equipped and stylish to be simply a family mobile. So, what is the TSX? It's an entry-level luxury sedan that's reliable, comfortable and attractive and comes with a long list of standard features. The TSX hasn't seen many changes since 2010, which was the second year of the vehicle's second generation, and the 2014 edition is a direct carryover from 2013, which was essentially the same as the 2012 version. Despite the lack of change, the TSX doesn't feel dated in terms of performance, styling or technology comfort features, but it does lack even the option for some of the newer safety technologies found in other Acuras, such as a blind-spot warning system or active cruise control. 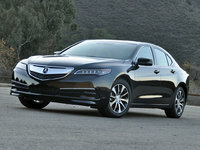 Acura designates five trims for the TSX sedan—TSX (base), TSX Special Edition with automatic transmission (AT), TSX Special Edition with manual transmission (MT), TSX with Technology Package and TSX V6 with Technology Package—although this list could be trimmed to 4, since the only difference between the Special Edition AT and the Special Edition MT is, you guessed it, the transmission. And if you need more cargo space, there are two wagon trims: the TSX Sport Wagon and TSX Sport Wagon with Technology Package. These Sport Wagons offer the same amenities and interior quality as their sedan counterparts, nearly the same level of driving performance, and actually receive compliments for their sleek design, a rare feat among station wagons. Six of the 7 trims are powered by a 2.4-liter inline 4-cylinder (I4) engine that produces 201 horsepower and 170 lb-ft of torque with the 5-speed automatic transmission and 172 lb-ft with the 6-speed manual transmission, which is available only in that Special Edition MT trim. The AT trims get 22 mpg city/31 highway, the MT trim gets 21/29, and the Sport Wagons come in at 22/30. The TSX V6 engine is a 3.5-liter that produces 280 hp and 254 lb-ft of torque and gets 19/28. All TSX trims are front-wheel drive, which cuts into their ability to be as sporty as other luxury-brand sedans, especially their German counterparts. Still, the TSX is pleasant to drive. The I4 offers enough power for most, and the V6 is a nice option if you want a little more under the hood. The steering is responsive, the ride is comfortable, and the braking is reliable. There's a clean and modern feel to the TSX cabin, the touch materials are high quality, the layout makes sense, and the seating is extremely comfortable, although the rear seat is best suited for 2 adults, not 3. The trunk measures an adequate 14 cubic feet, and the rear seats offer a 60/40 split for added room. The Sport Wagon provides 66.2 cubic feet of space with the rear seats folded flat. Part of the reason it has so much room is because the cargo floor is practically flat, but that's because there's no spare tire in the Sport Wagon trims, only a repair kit. The tasteful interior design is complemented by a plethora of features that come standard with the base TSX trim, including heated front seats, dual-zone automatic climate control, leather upholstery, an 8-way power driver's seat, a 4-way power passenger seat, leather-wrapped steering wheel and shift knob, Bluetooth, cruise control, power moonroof, steering-wheel mounted controls (cruise, audio, phone, information display), two 12-volt power outlets, ambient lighting, an auto-dimming rear-view mirror, heated exterior mirrors, fog lights, HID headlights and a 360-watt, 7-speaker sound system with subwoofer, speed-sensitive volume, SiriusXM Satellite Radio, auxiliary input jack and USB interface with iPod integration. The Special Edition trims get ebony suede seat and door panel inserts with red accents, red instrument illumination, aluminum sport pedals, ebony headliner, unique 17-inch alloy wheels and red stitching on the seats, steering wheel, shifter and armrest. The Technology Package trims (I4, V6 and Sport Wagon) add to the base features with a navigation system with voice recognition, Zagat restaurant reviews and ratings, real-time traffic and weather, and traffic rerouting; a premium Surround Sound audio system with hard-disk-drive media storage, 10 speakers and Song By Voice; GPS-linked and solar-sensing dual-zone automatic climate control; upgraded Bluetooth, rear-view camera and micro-finish trim on console and doors. The Sport Wagon with Technology also gets a power tailgate, and the V6 comes with 18-inch alloy wheels and Active Sound Control. 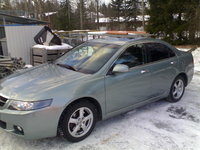 While it may not have all the latest in safety electronics, the TSX does come standard with a 6-airbag system, active head restraints, antilock brakes with electronic brake distribution and Brake Assist, tire pressure monitor and Vehicle Stability Assist, which constantly monitors speed, throttle, steering angle, G-force and yaw rate and can make automatic adjustments to the engine torque and antilock braking system. 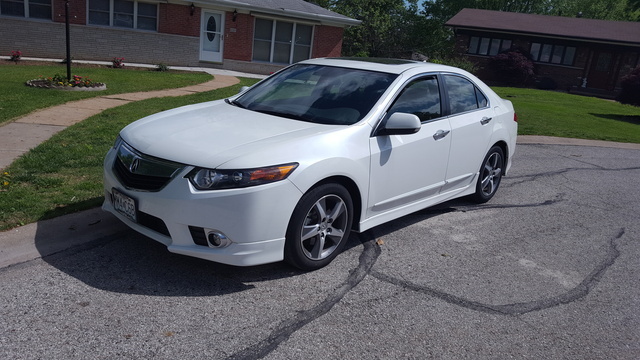 The 2014 TSX hasn't been crash-tested yet, but the identical 2013 model received top scores of Good from the Insurance Institute for Highway Safety for front, side-impact and rear crash tests and for roof strength. 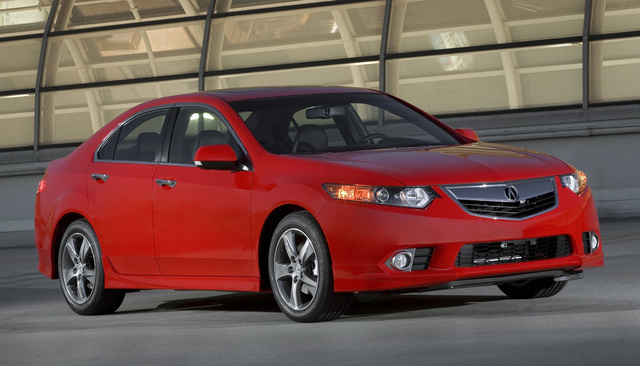 What's your take on the 2014 Acura TSX? Have you driven a 2014 Acura TSX?